The friends that came to visit yesterday kindly bought an enormous chorizo with them. We ate some yesterday but had plenty left over so decided to use it in this salad that we originally saw on Something For The Weekend. It was really good, the capers and sherry vinegar cut through the oiliness of the chorizo really well. Subscribe to comments with RSS	or TrackBack to 'Chorizo and Squid Salad'. This looks delicious! 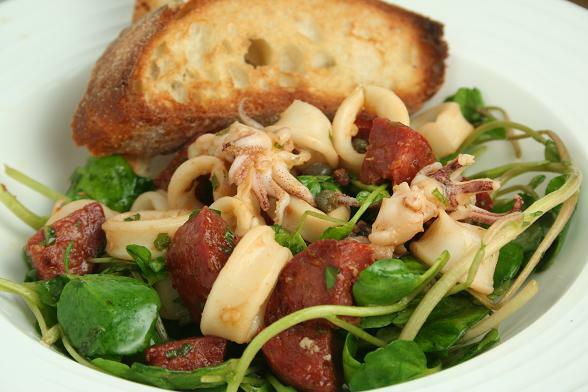 Trying to find or come up with a recipe using chorizo and squid and I think I might take this and adapt it to some sort of pasta dish possibly… love the photo – really makes my mouth water! Thanks, GC. It is a great thing to have in the fridge but I do find myself nibbling away at it quite a lot! I love the pasta idea, CC. We were talking about something similar on Monday actually. Such a classic combination of flavours – and your salad looks particularly delicious! Great photo too.